I’ve loved the Harry Potter series for years, and for my birthday, my parents surprised me with a (very) expensive Ravenclaw House blazer! 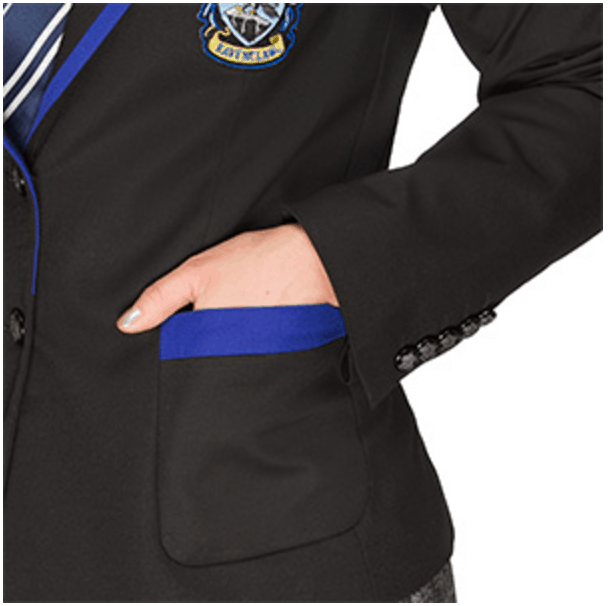 I love it, and it definitely fits my classic style, but it has a pretty big Ravenclaw emblem on it, as well as piping, and the inside of the blazer and the buttons have the Hogwarts crest on them. I do think the blazer is cool, but how would I go about styling it, to make it look like an outfit, and not a costume? I want to look put together, but not like I just came out of Charms class! First of all, happy belated birthday! 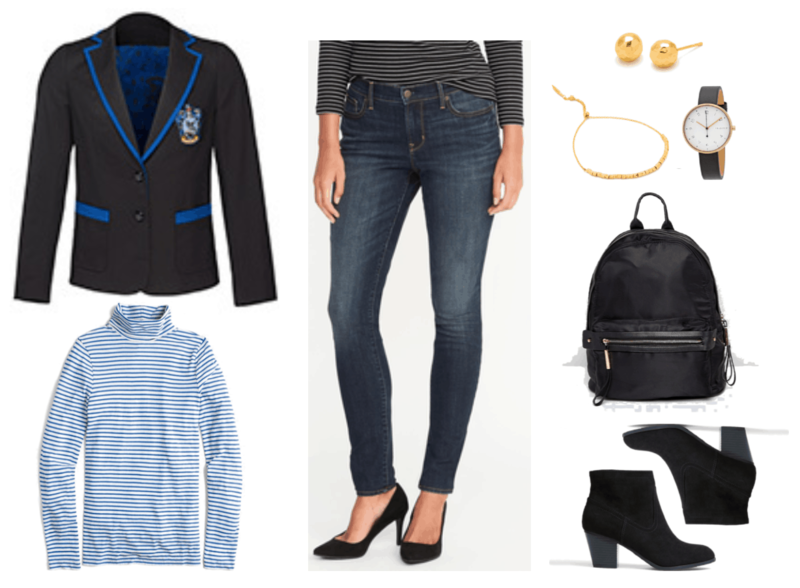 Secondly, based on your letter, it sounds like you already have a pretty good instinct for style in terms of what will work when it comes to styling your Ravenclaw blazer. 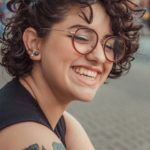 You seem to already know that when it comes to fashion based on fandoms or other things that are normally perceived as “geeky,” there is a fine line between tasteful and tacky. In order to stay on the tasteful side, it’s a good idea to keep the rest of your look simple and classic, and to let the blazer do most of the talking. Furthermore, I believe that I have found the exact blazer that you describe in your letter (or at least, one that is very close to your description!) so I will be using it for all outfits shown in this article. 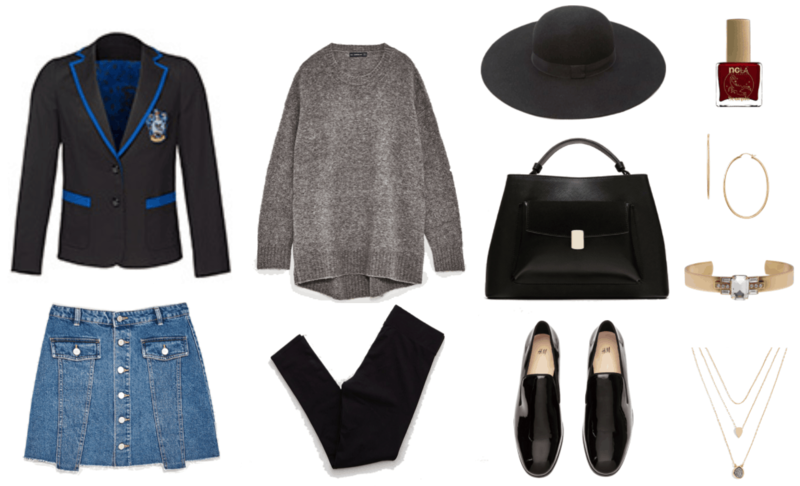 With that in mind, keep scrolling to see four looks that you can wear with your Ravenclaw blazer. A striped turtleneck t-shirt will look great with a pair of dark-wash skinny jeans, and both pieces are understated enough that you can pair them with your blazer without having to worry about any clashing taking place. A simple black backpack and black Western ankle boots streamline the look, while timeless jewelry, like these gold faceted ball stud earrings, adjustable beaded bracelet, and sleek watch nicely complement the look without going over the top. For a fall-ready feminine look, try layering your blazer with a mustard-colored shirt-dress. I love the idea of pairing the dress and blazer with some cognac-colored ankle boots and cozy cable-knit socks (scrunch them down so that just the tops show over the boots). Add a luxe snake-embossed cross-body bag and delicate jewelry in mixed metals–I really like this initial disc bracelet, stacking ring set, and dainty chain stud earrings. I also am a big fan of this cool menswear-inspired watch to add some contrast. Wrap a neutral-colored patterned scarf around your neck to complete this lovely look. This cute and comfortable outfit is a great weekend look for chillier days when you want to wear your blazer. 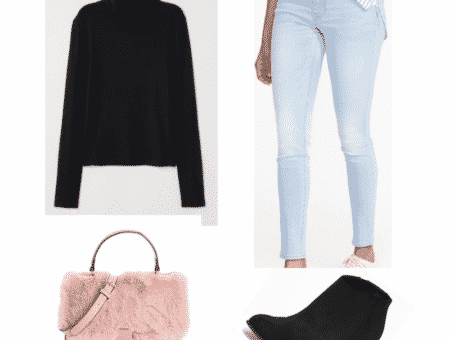 A denim mini looks so chic when peeking out from beneath the hem of an oversized sweater. Basic black leggings are a more casual alternative to opaque tights, while these black loafers are a low-key way to incorporate the patent (faux) leather trend into your everyday look. Large gold hoop earrings, a bejewelled cuff bracelet, and a triple-layer druzy necklace are all very fashionable but easy-to-wear jewelry options; painting your nails a deep burgundy shade is also an easy way to make a style statement that’s perfect for Fall. This roomy black bag is a sleek way to carry around your essentials, while a black wide-brim hat perfectly tops off the look. The relatively casual pieces that this easy-to-wear look is made up of provide the perfect backdrop for showing off your blazer. A gray short-sleeved crewneck t-shirt is an essential layering piece, and here I’ve decided to pair it with a trendy pair of cropped flare jeans. I love the metallic gold detail on these otherwise-plain white sneakers, and the patent faux-leather material of this mini tote goes so well with its rich burgundy hue. Dainty jewelry completes the look; here, I’ve chosen an interesting pair of geometric stud earrings, a skinny cuff bracelet with edgy black stones, and a long gold wrap bar necklace. 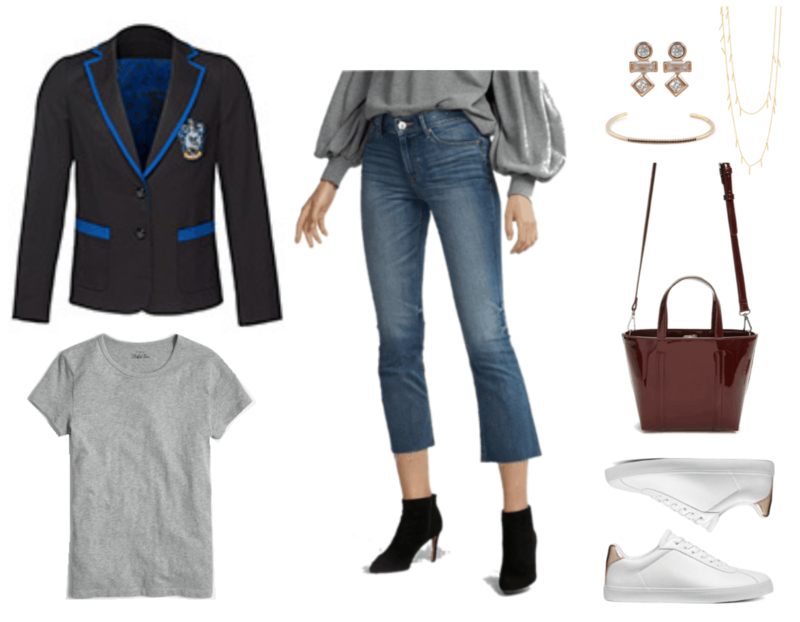 I hope that these outfits have provided you with some inspiration on how to wear your Ravenclaw blazer in a way that is chic, not geeky, and that you enjoy experimenting with different ways to wear this fun piece! 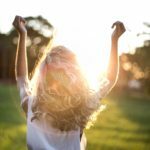 Thanks for your question! 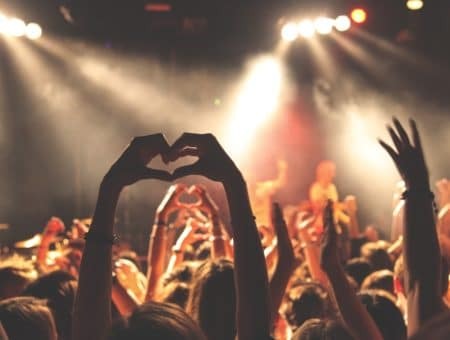 Do you own any clothing dedicated to a specific fandom? 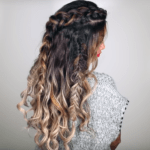 If so, how do you style it? How would you style this Ravenclaw blazer?